Choro de Rua, new CD in 2019: Crowdfunding! Hi to everybody! 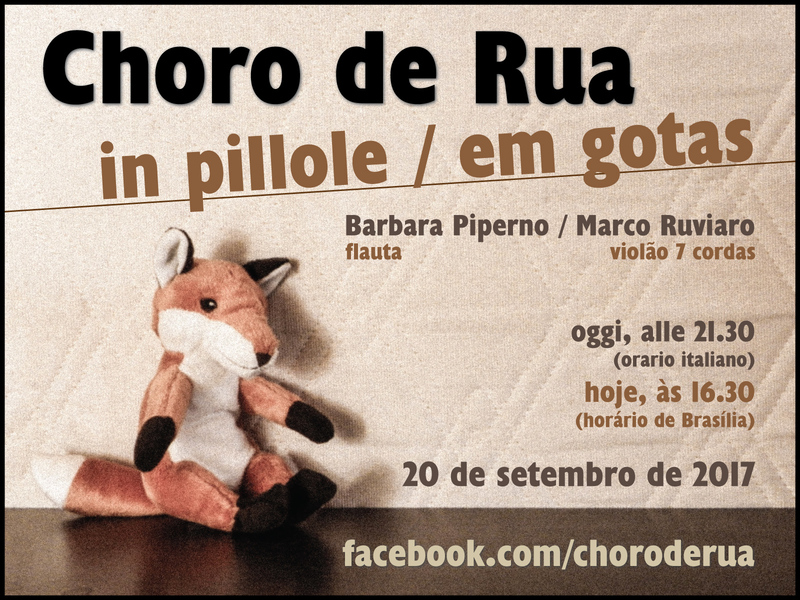 We are Choro de Rua: Barbara Piperno (flute) and Marco Ruviaro (7-string classical guitar). 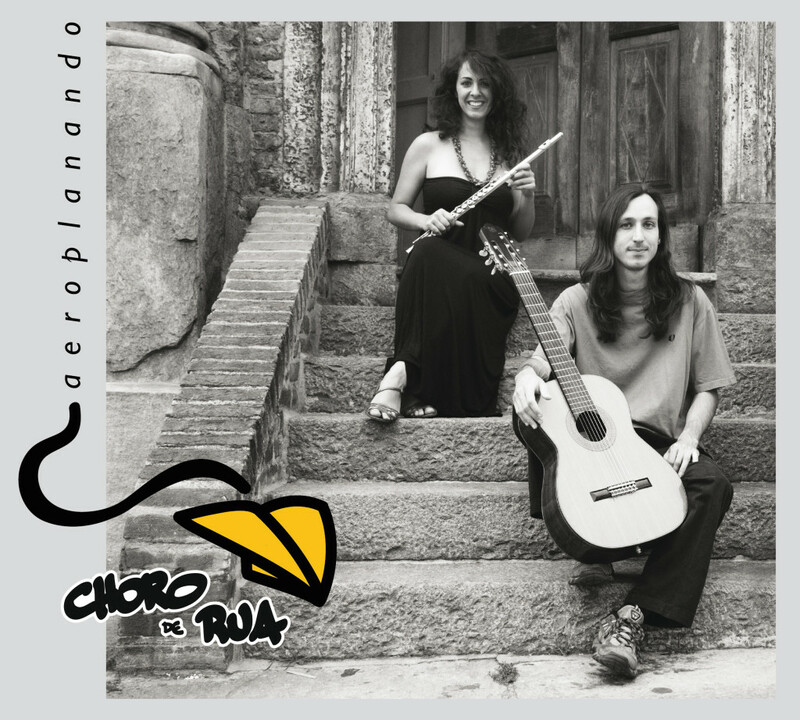 We are here to invite you to collaborate with us for our new project: the realization of a new album of Choro de Rua which is going to be launched between March and April 2019! 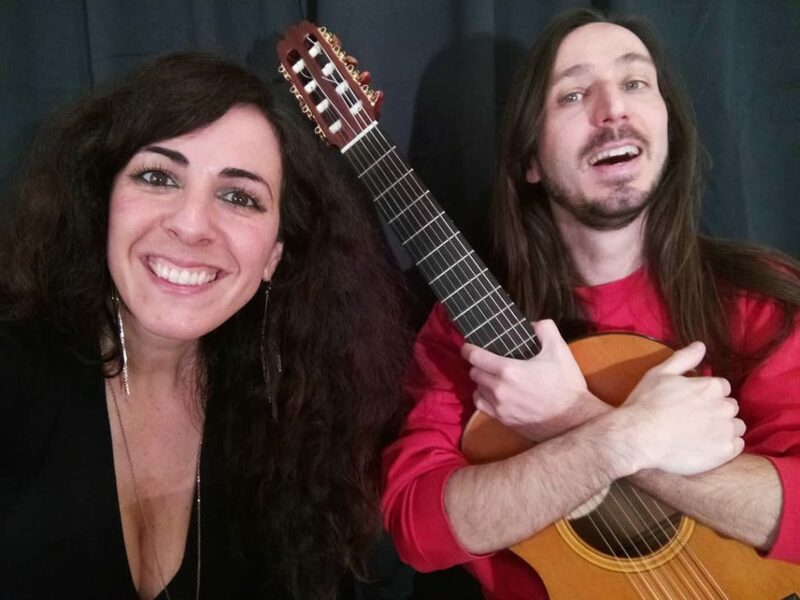 We are really excited and happy because this CD will consist of a special repertoire, made up of musical tracks related to the world of Choro, written by contemporary composers and most of them are also our friends! The donation value is completely free, but we chose some rewards. Select your favorite one! 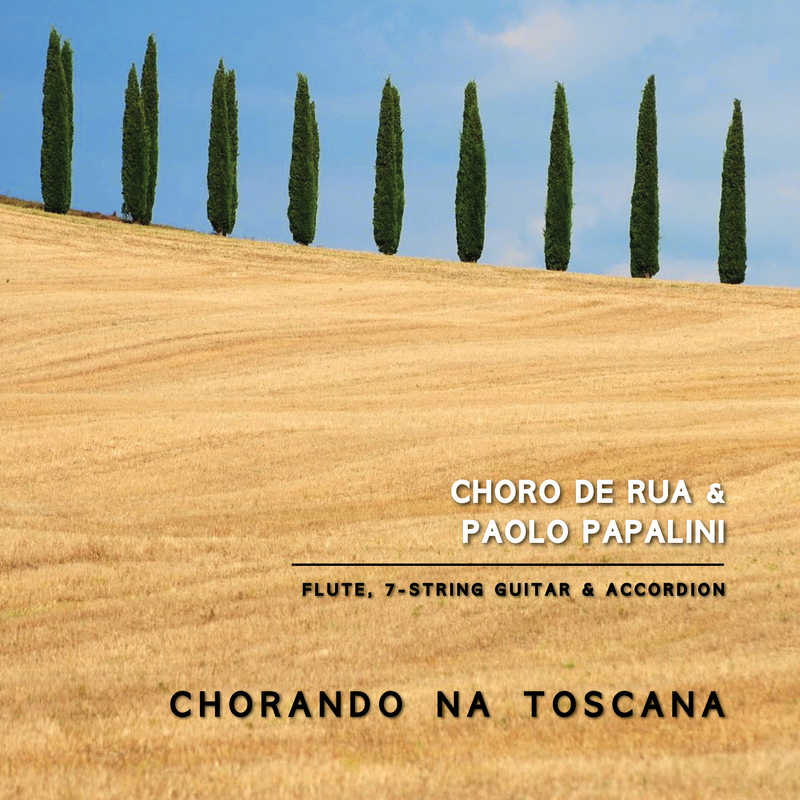 For those who don’t know us, Choro de Rua has a mission, carried out with a lot of enthusiasm since 2012: we are trying to spread and disseminate Choro anywhere (in Italy and around the world). How we do it? Playing, in shows and and on the streets (especially in the south of Tuscany) where we meet a lot of people from all over the world, also some musicians, that end up discovering Choro through us; we organize a lot of Rodas de Choro here in Bologna (but not only, also in other cities) almost every week; we also distribute and edit scores; we do workshops of Choro in Italy and in other places in Europe; we always invite musicians and friends to come to Bologna to play with us! Another important and fundamental step of our mission is the realization of our new CD: would you like to help and support us in this new adventure? To do this, we created a crowdfunding to collect donations from those who will want to help us! You will find the link, here below, with all the information and rewards. It will start from the 14th of January. Why? Because it is my birthday! And next week, 7 days later, on the 21st of January, it will be Marco’s birthday! So, if you like the idea, you can consider your support also as a birthday present! Thank you from the bottom of our hearts, in advance, for your help, friends and fans, near and far! In the next days we will publish other videos with information, details about compositions, composers and production updates. Rewards for who lives in Italy/Europe! 5 autographed copies of the CD + 1 CD Aeroplanando + 1 CD Acabou o sossego + 1 CD Choro na Manga + 1 CD Delicious Orchestra (all with a special dedication) + 1 online lesson with Choro de Rua duo + eternal gratitude + special thanks with your name in the album! Recompensas exclusivas para quem mora no Brasil! 5 cópias autografadas do CD + 1 CD Aeroplanando + 1 CD Acabou o sossego + 1 CD Choro na Manga + 1 CD Delicious Orchestra (todos com dedicatória especial) + 1 aula online ou presencial com o duo Choro de Rua + gratidão eterna + agradecimento especial com o seu nome na capa do CD! Rewards for who lives in the rest of the world! 5 autographed copies of the CD + 1 CD Aeroplanando + 1 CD Acabou o sossego + 1 CD Choro na Manga + 1 CD Delicious Orchestra (all with a special dedication) + 1 online lesson with Choro de Rua + eternal gratitude + special thanks with your name in the album! — CHORO DE RUA EM GOTAS, hoje tem mais um episódio da série que está fazendo estremecer as relações diplomáticas internacionais! Às 16.30 horário brasileiro, às 21.30 horário italiano! Curta agora mesmo a página do Choro de Rua, caso você ainda não o tenha feito! — CHORO DE RUA IN PILLOLE, oggi c’è un’altra puntata della serie che sta facendo tremare le relazioni diplomatiche internazionali! Alle 16.30 orario brasiliano, alle 21.30 orario italiano! Se ancora non l’hai fatto, metti subito il tuo MI PIACE sulla pagina di Choro de Rua!